Known as the very first SUV to acquire third-row seating, the Acura MDX has always stood on the edge of innovation. It's a midsize luxury crossover like no other with endless capabilities and a design that showcases the synergy between man and machine. Redesigned for 2014, the MDX has been fully upgraded with new exterior elements, interior features, technological functions and powertrains. Each addition is integral to the crossover's new concept, which is sure to leave its mark on the auto industry. Read on for a brief overview of the 2014 Acura MDX in Phoenix, then scroll down for more information on its specifications. The elegant 2014 Acura MDX features a flowing design with smooth curves, slight chrome accents, sleek LED headlamps and a new aerodynamic design that improves aerodynamic efficiency by 17 percent. The SUV's interior shows off a restyled sloping dashboard and premium materials, but focuses on space and comfortability. Second-row seating has been outfitted with four-position reclining, an Extended Slide component and One Touch Walk-In, a system that automatically folds down the seats with just the touch of a button. The front row has also been modified for maximum comfort with a 10-way power adjustable, heated driver's seat and an 8-way adjustable passenger seat. Additionally, a large center console provides storage for laptops and iPads during long family road trips. 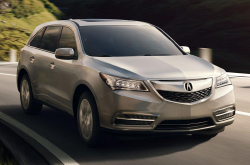 The updated MDX models come equipped with only one powertrain: a 3.5L i-VTEC direct injection V-6 engine - acknowledged by many 2014 Acura MDX reviews. Derived from the same concept as two racecars, the engine exerts 290 horsepower and 267 lb.-ft. of torque. It's parried with a six-speed automatic transmission and achieves optimal EPA ratings, increasing fuel economy, which is a sought after attribute in today's economy. For 2014, the MDX is being offered in both all-wheel- and two-wheel drive. New mechanics such as MacPherson strut front suspension, Amplitude Reactive Dampers and multi-link rear suspension also work together to create exceptional performance.